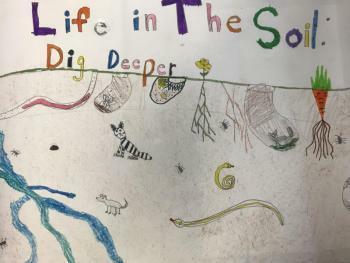 Knox-Lincoln Soil & Water Conservation District is pleased to announce – and congratulate – the winners of the annual conservation poster contest. This program is part of the National Association of Conservation Districts’ contest, which each year sets a national stewardship theme. Rebecca Jacobs, KLSWCD program manager, presented a lesson on this year’s theme, Life in the Soil: Dig Deeper. to over thirty K-6 grade classrooms throughout Knox and Lincoln counties. We greatly appreciate the enthusiasm, knowledge, and support of this year’s judges – Sharon Chadwick, District Supervisor; and BJ Dobson, District Volunteer – who evaluated more than 300 posters on content, visual effectiveness, originality, and universal appeal to select the winners. Honorable mentions were awarded to: Gavin Campbell, Rowan Stewart, Mallory Watkinson, Olive Tomko, Isla Hancox, Eliza Gallant, Aubrey Sylvester, Matilda Stewart, Helena Leavitt, Atalanta Roberts, Thea Laukka, Alanna Smith, Grace Bickford, Tabitha McGregor, Baileigh Hooper, Vincent Frisone, Pedro Adorno, Ava Curtis, Oscar Barnes, Franklin Whytock, Hayden Libby, Aiden Beardsley, Kamryn Snell, Skyler Spoffurd, and Gabriel Wood. Knox-Lincoln Soil & Water Conservation District congratulates all the winners and commends all the students for their efforts. For the complete list of winners and pictures of category winners, please visit http://www.knox-lincoln.org/poster-contest. For more information about this and other District programs, please contact Rebecca Jacobs at rebecca@knox-lincoln.org or (207) 596-2040. Knox-Lincoln SWCD is an equal opportunity employer and provider.